I think this top will look familiar to those of you who know the third Pattern Magic book, Pattern Magic: Stretch Fabrics. It's based on the design on the cover: Straight lines and curves A. Obviously, I didn't make it entirely as it's shown in the book. I used my own knit sloper and I really didn't think that the cropped design would be very practical in wardrobe. 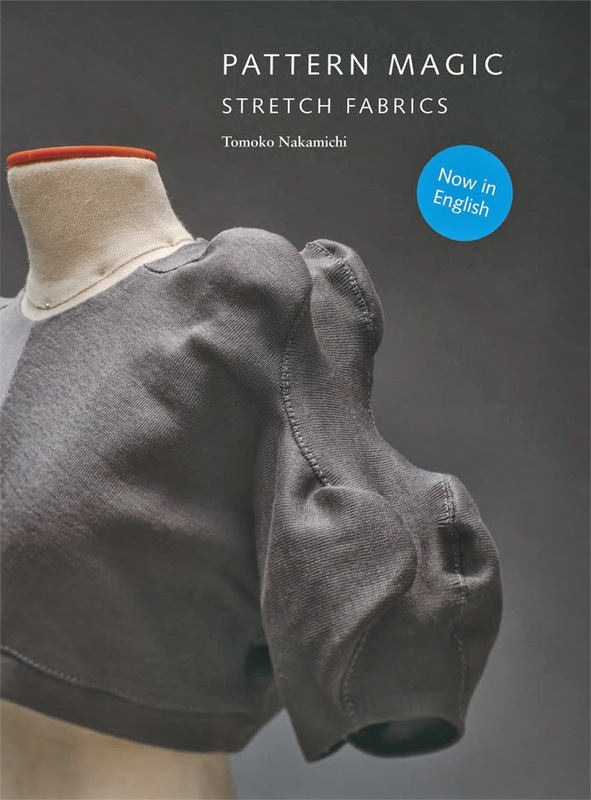 This design is all about creating shapes in knit fabric by stretching some parts to others. 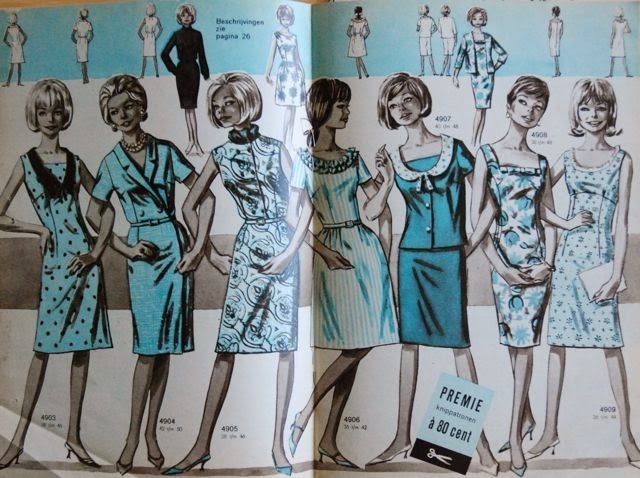 In this case, you draw curvy lines on the top edges of the the front and back pattern pieces and sew them to a straight strip of fabric over the shoulder line which you stretch to fit the curves. The fabric I used is a navy coloured rib knit, I thought that would work well for the stretching. It's a bit of a different look for me, with the prominent shoulders. On the other hand, it kind of reminds me of more regular puffy sleeve designs. Just different. I originally made this top to go with my most recent pair of jeans but the proportions don't quite work with those. Fortunately, they will work with other things in my wardrobe. It was nice to try another bit of Pattern Magic. 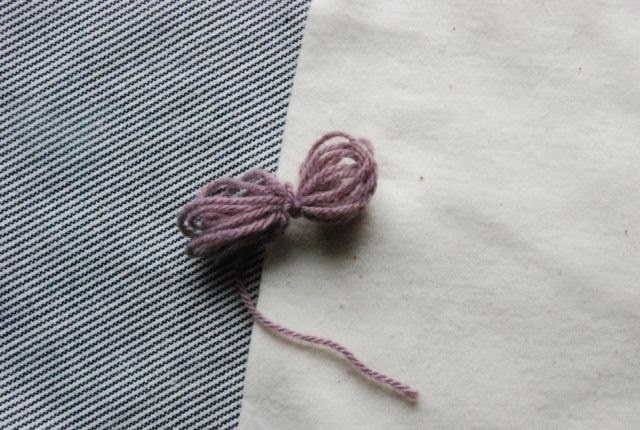 This was actually a very simple trick which creates quite a dramatic result in a stretch fabric. 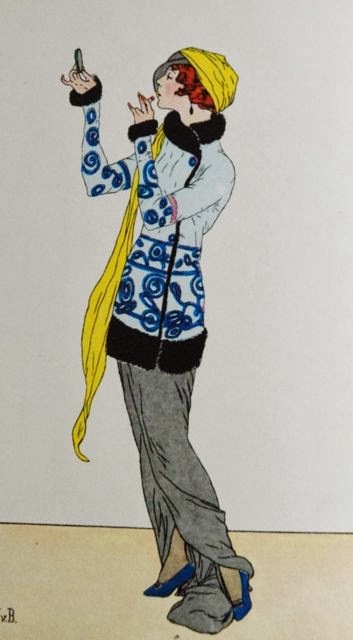 The book also contains a Straight lines and curves B but I'm not such a fan of that design (a loose fitting top with bulges at the shoulder blades). However, I could try and come up with some variations of my own. Today, we took some pictures of my new jeans. To be honest, I didn't wait till now just for lack of photo opportunities (last week was rather good for daylight). While sewing the jeans, I had also been dreaming up new things to wear them with and I wanted to work on some of those too. In the end, only one thing was really finished by the time E had the opportunity to take pictures: this loop-scarf thingy. Is this called an infinity scarf or is that term only for the longer and narrower variety. I was working on a top but it still needed to be hemmed and it didn't really look right with the trousers anyway. I've told you about the design of these jeans before. It's basically a classic cut for trousers, executed in thin denim. I'll probably wear a top over them most of the time but I wanted to show you the waistline treatment and the pockets. Those vertical welts (a feature which wouldn't work in more fitted trousers but is absolutely fine here), pleats and fly, all without a waistband. I'm quite pleased with the fit. Level top edge, no weird folds in the legs and the position of the back pockets looks good too. The scarf was a really easy and quick thing to make on the knitting machine. For something like this, the fake rib knit option is great. 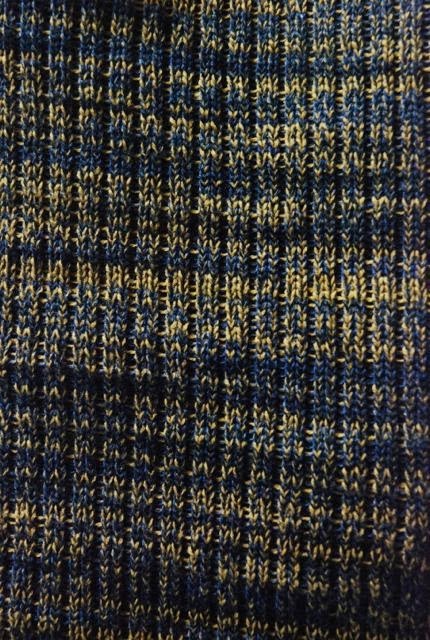 I knitted together three different kinds of really thin yarn: two blue ones and an ocher yellow. I like the tweed-like blended effect it gives and it's a nice way to use this very thin yarn. And it allows me to that yellow without looking sick. I should still have enough of this denim left over for another pair of trousers and I've been thinking about jeans a lot while making these. So, expect to see more in the time to come. Thank you for all the interesting replies to my previous post. I think the real world advice from the mothers among you adds quite a different angle to what otherwise can become a rather ideological discussion. After all the comments about wear and laundry, I'm really doubting my mother's choice of fabrics. She's a mother of three herself, so I would have thought she'd remember those considerations. Anyway, I went with her choice, as promised. 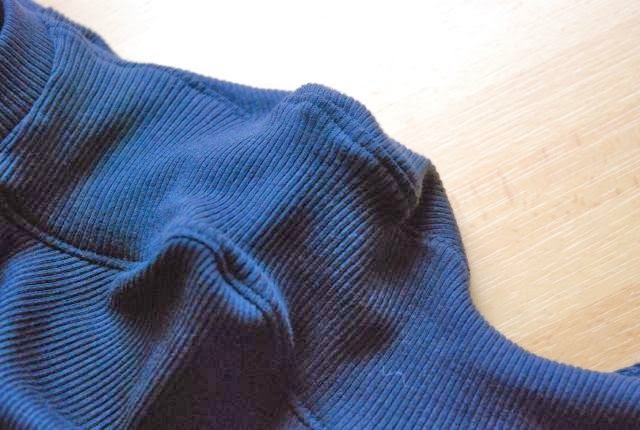 I just took the liberty of using some of the dark blue rib knit for the neckline edge. This is the outfit. 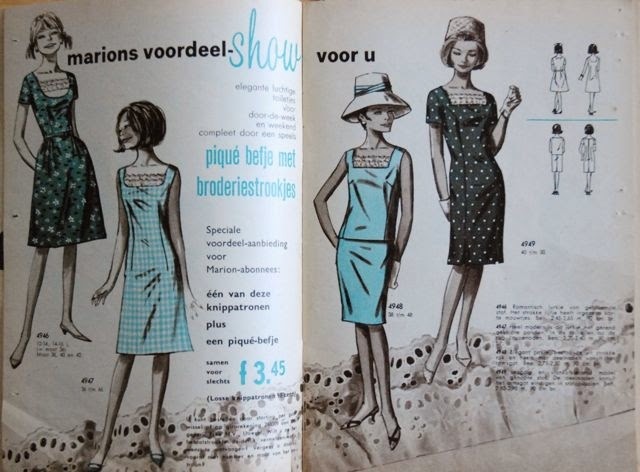 Both items are based on patterns from Knippie magazines from 2012. I made some changes, eliminating details which I just thought were stupid. A fake fly? A back yoke which so doesn't do anything that it's actually attached to the back on the pattern (you were supposed to cut it off, cut it separately from the fabric and then sew it back on)? 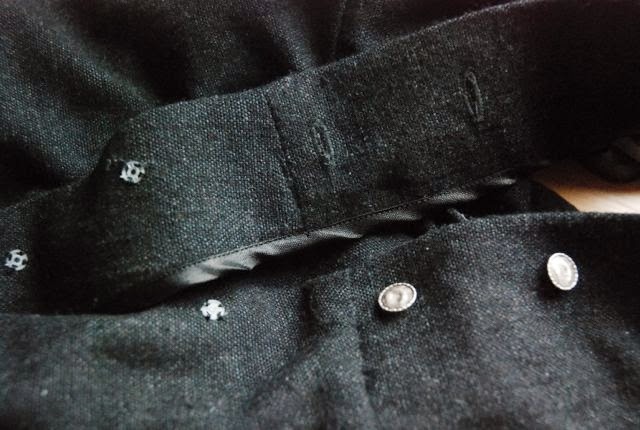 A chest pocket to be applied by straight stitch topstitching, in jersey? Some people may like such details, which were probably included to make the items look like miniature versions of clothes for more grown-up people. I don't. I'm more of a 'form follows function' kind of seamstress. We're going to my parents for a family dinner on Saturday, so I'll meet baby J and his proud parents there. I hope they'll enjoy the outfit. My jeans are finished but still await a photo opportunity. So, I thought I'd talk to you about the project I've just started on. And the issue that stirs up. I'm making another outfit for my nephew, baby J. 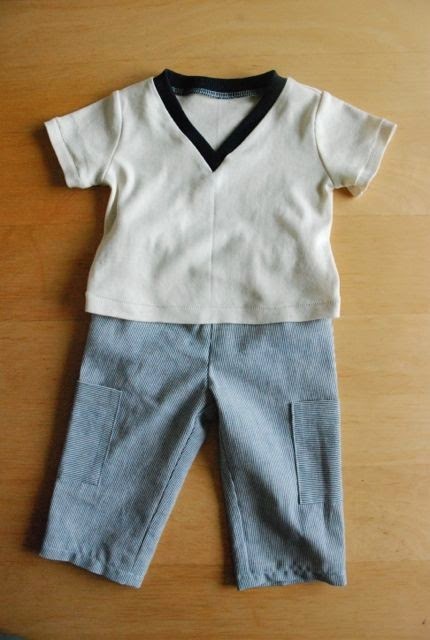 My mum, his gran, has been knitting a a cardigan for him and she asked me to make a t-shirt and a pair of trousers so we could give him a complete outfit. She picked the yarn a while ago. It's kind of lilac. Based on that, she first suggested I would make both trousers and t-shirt in beige. I thought that would be just a bit... eh... So I came up with other suggestions and sent her swatches: dark blue jeans (the same thin jeans I've just used for myself) with unbleached cotton jersey or beige cotton twill with dark blue rib knit. 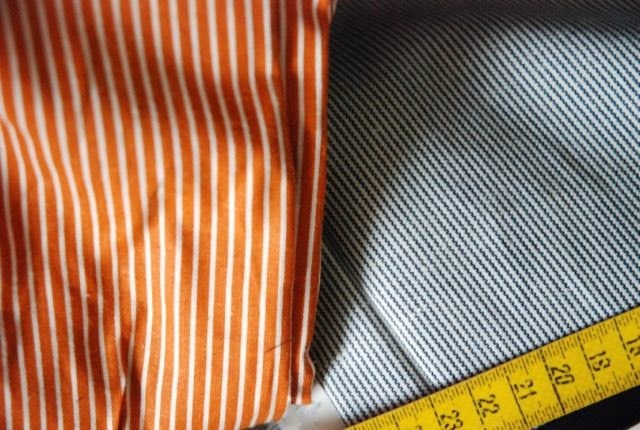 I also threw in a scrap of dark blue an off-white striped cotton. She chose the stripe and the off-white jersey. I guess she really didn't want any dark colours for this outfit. Which is a bit surprising for a woman who knit a dark blue wrap for her first-born (that would be yours truly) during her breaks at work despite the criticism of a co-worker. Oh well, opinions change over time. My mother's choice of yarn surprised me a bit. I don't know why she picked this colour. It doesn't exactly scream 'baby boy'... 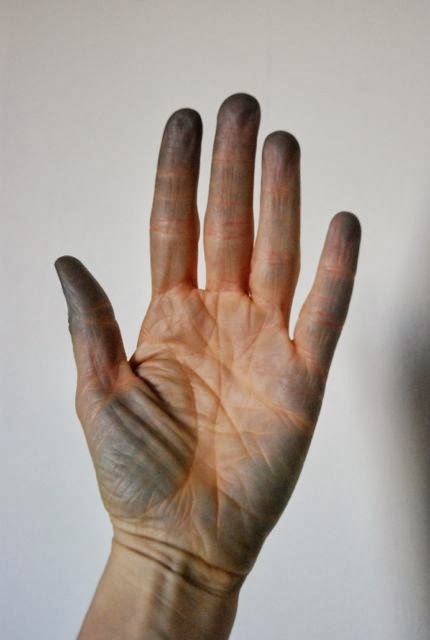 I would have gone for a brighter and/or stronger colour. I don't think she has consulted my sister, J's mother either. When I did so before sewing his coat-suit, she told me, and I quote: "Tough and beautiful colours look well on J, e.g. light or dark blue or green. Brown or grey can look nice as well. I think plain black and white would be boring but of course, these could work in a combination. Girly colours are, of course, not suitable for him". He was eight months old at the time. I didn't comment on it then but I was a bit surprised at the completely spontaneous gender stereotyping. In my opinion, no casual observer could possibly guess the gender of a child of that age if he/she were wearing his/her diaper. So I don't really buy into the theory that he would obviously look best in "real boy's" colours... Of course, the unisex look of any infant might be why a parent would want to show the gender through clothing. Of course, we were talking about a winter coat so that may have been a factor in her considerations. I made a blue coat with red rib knit details and they were happy with it. It still puzzles me though. Looking at the young parents among my friends and family, it seems to be such a natural thing to show off the gender of children too young to have any notion of it. You'd almost think it was a general human tendency to do so. Except that history-mad me knows that it isn't. 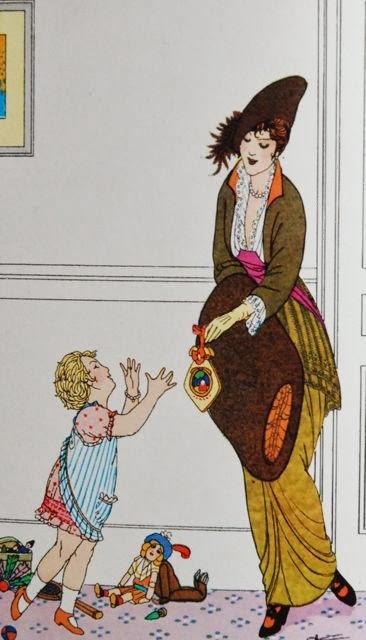 To start on the issue of colour, the 'pink for girls, blue for boys' rule which seems so normal now is, in fact, less than a century old. 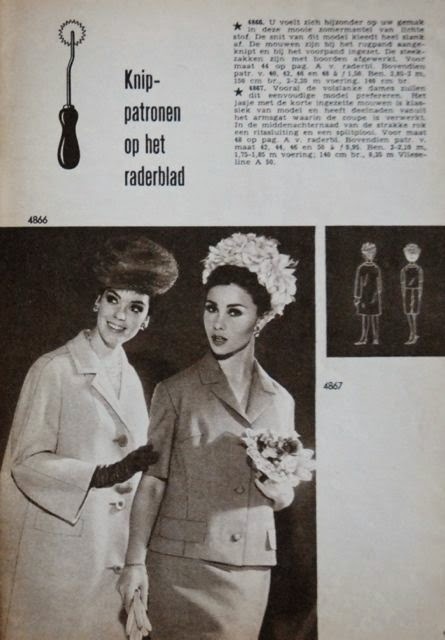 Here in the Netherlands, it came in after the Second World War, under the influence of American products and advertising. 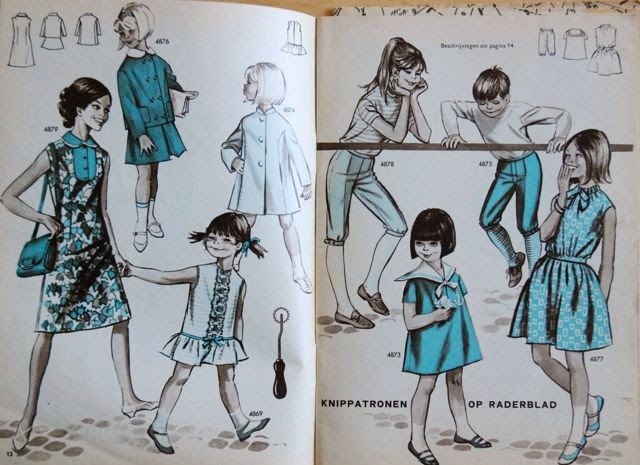 Before that, children's clothes weren't strictly colour-coded. And if anything, pink was for boys. This owed to old colour theories in which red was a real men's colour, symbolizing courage and strength while blue stood purity and tranquility. 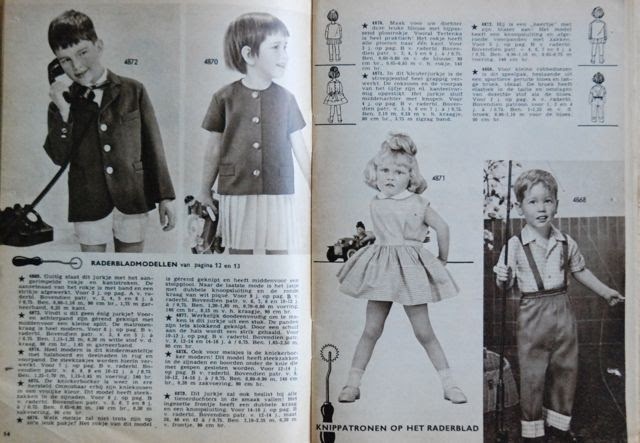 For children, lightened versions of colours were deemed appropriate, so pink for boys. If you would like to read more about colour stereotypes, go this blog which I just found when researching pictures for this post. 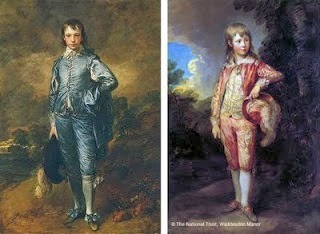 And if you thought my remark about the unisex look of infants was a bit crazy, what would you say if I told you that for a long time, all children up to about three years of age were dressed the similarly. In skirts. 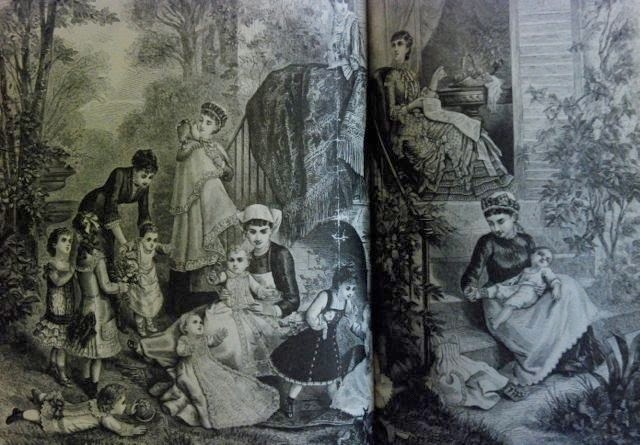 In this picture (this and the next are from late 19th century Harper's Bazar), all the non-standing children are just described as 'infants' without any distinction in gender. When they got a bit older, differences between boys and girls were introduced gradually. The small child here is dressed in an "outfit for boys aged 2 to 5". So, he's in a skirt but the same outfit wouldn't be worn by a girl. Actually, I've got an anecdote to back up the evidence of these engravings. It's a story my father told me: As a child, he would often visit his grandparents. 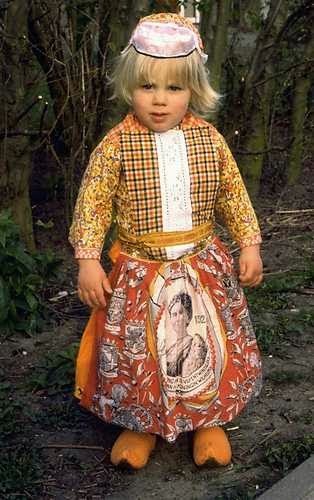 In their house, there was an old picture of a small child in a dress with long hair in pin curls. He had remembered it all that time because it was a picture of his grandfather, whom he knew as large, impressive man. I've never seen that particular picture (I wish more of those old family pictures were still around!) but it must have been taken around 1900. 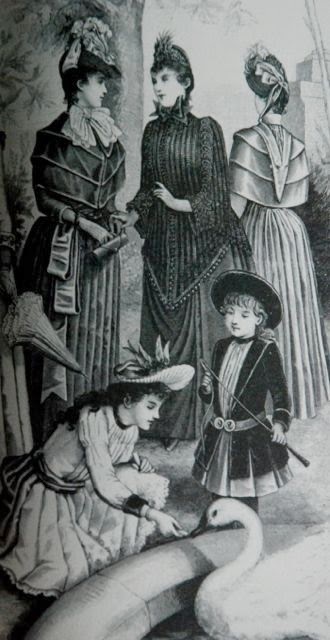 And don't think the practice of dressing boys and girls alike ended in the dawn of the 20th century either. It may have done for a lot of people but in regional costume, it stuck around for longer. 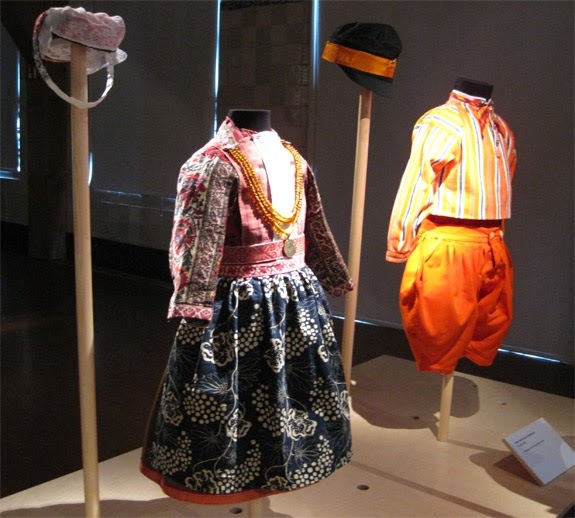 These are boy's costumes from the Dutch village Marken, as on display in the Zuiderzee museum (I mentioned the old fishing villages on the IJsselmeer before, in this post). 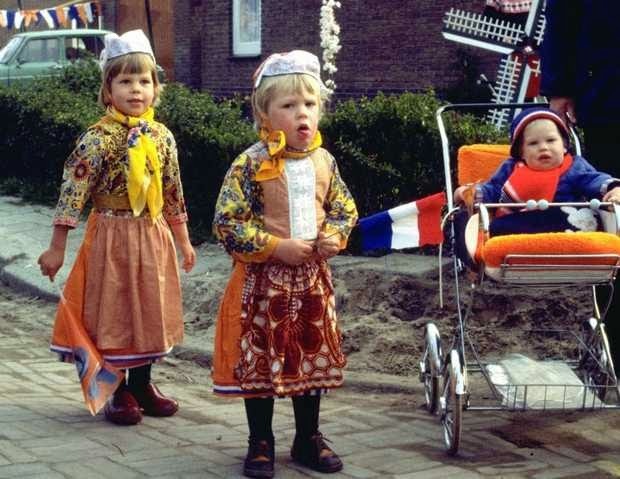 And here you can see a girl and a boy (first picture) and a boy (second one) wearing the special Queen's day celebration versions of the costume (that's why the outfits are all orange) in 1980 (I found the picture on this news archive site). Marken is one of the last places in the Netherlands in which traditional costumes are still worn and it likely that a lot of people will only still wear them for special occasions. Still, the boy looks perfectly comfortable in his skirt. And yet, if we wonder why adults think in stereotypes, doesn't it all start young? I'm not a mother, so maybe it's easy for me to criticize. What are your thoughts on colours and styles for small children? Are things there clear 'rules' for those where you live? And do you think parents should care about those? That right! Jeans. Proper blue jeans even. Most of my jeans-like trousers are in black or grey versions of the material but now I'm working with the real thing. 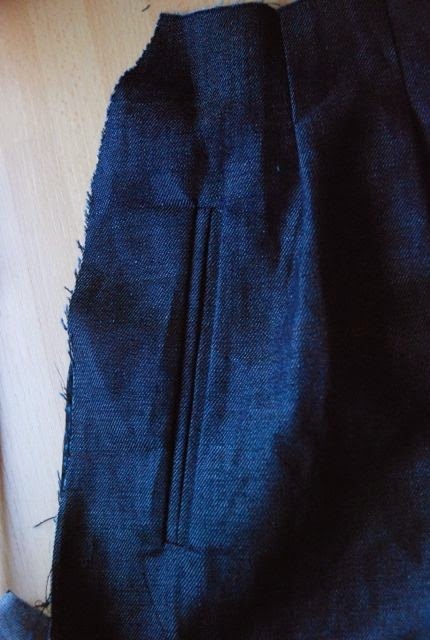 I'm working on a pair of trousers which I've been considering for exactly a year. How do I know that? 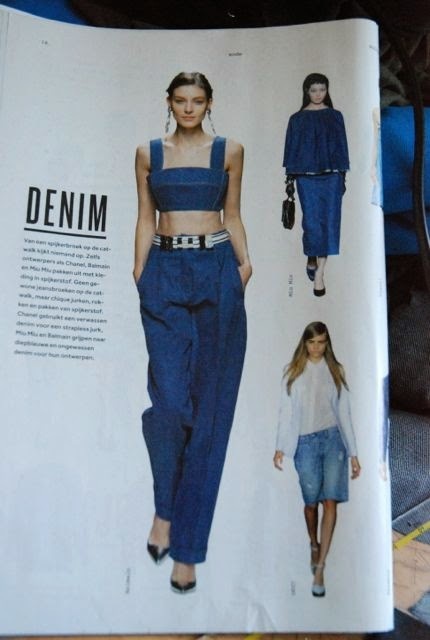 Well, I loved the trousers in this picture, which opened the spread about denim in the spring 2013 fashion special of Volkskrant magazine (the magazine which comes with the paper on Saturdays). I thought about making a knock-off version of my own (in fact, I'm pretty sure I showed this picture here on the blog before), but nothing came of it. 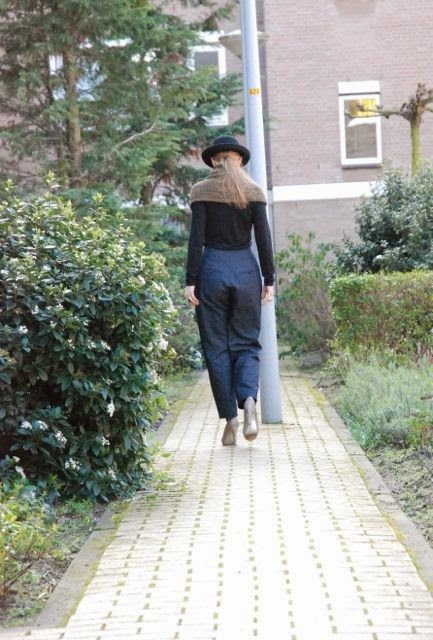 And last weekend, the Volkskrant published its spring 2014 fashion special. 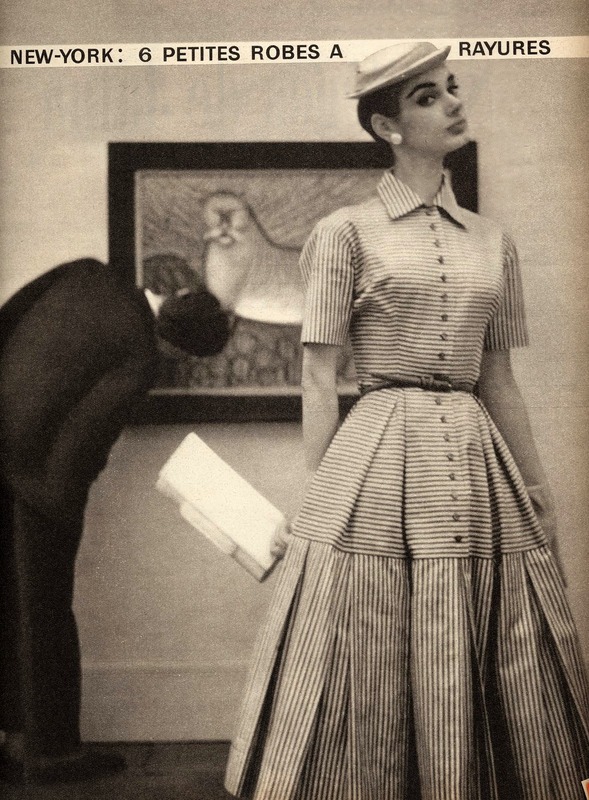 It's not such an unusual cut: Basically just pleated trousers fitted to the natural waist. It's unusual to see them in denim though. Which, in my opinion, is what makes them fun. 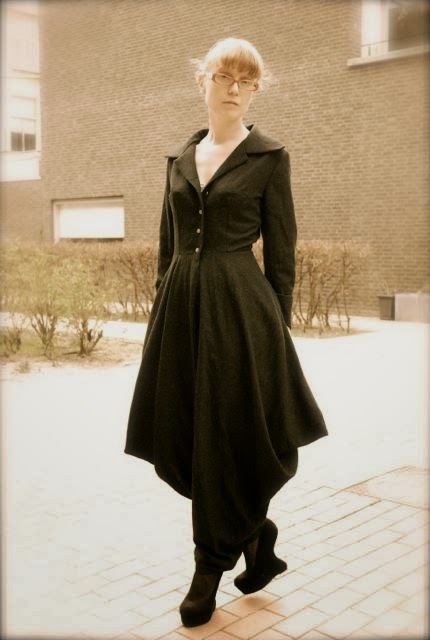 I drafted the pattern using my 'relaxed fit' trouser block (which has a slightly lowered crotch and some more ease in the hip area) and took care to include the non-standard features of this design: two narrow pleats facing away from each other (rather than both towards the side seam) on each leg and vertical welt pockets at the front. the horizontal ones at the back, with their button loops and the pockets on the inside. And I've finished the fly as far as possible. 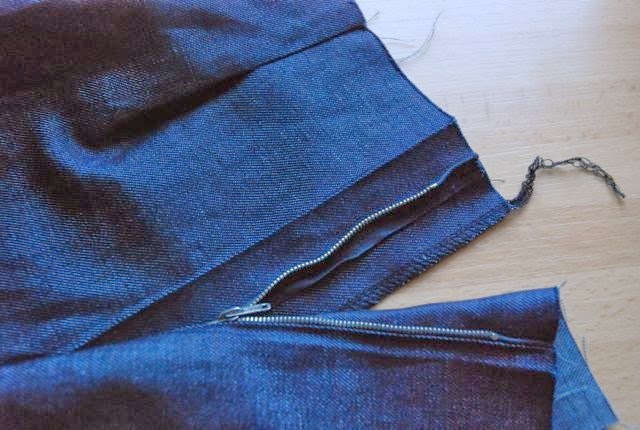 With a facing instead of a waistband, stitching down the fly has just become one of the last steps in construction. 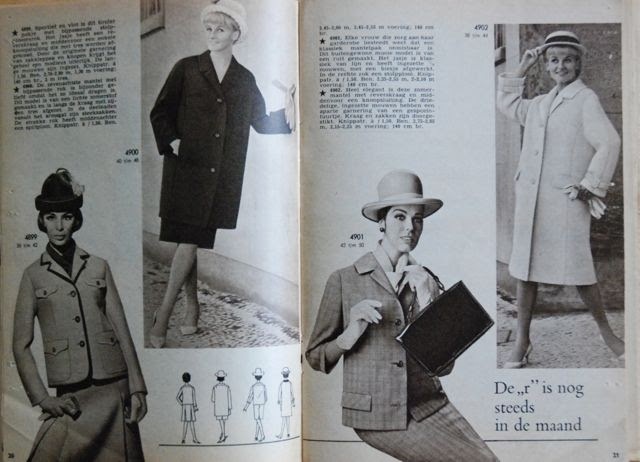 In fact, I think I know what I'll make first: That jacket I loved in the 1970's Frohne magazine. Other than though, I should really start exploring. 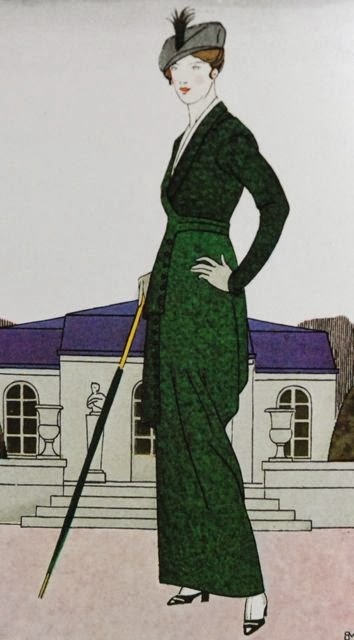 I usually like styles from 1947 to about 1960 and I have warmed to the 1930's when researching for my green dress last winter. So, I'll have to brush up on the other decades. 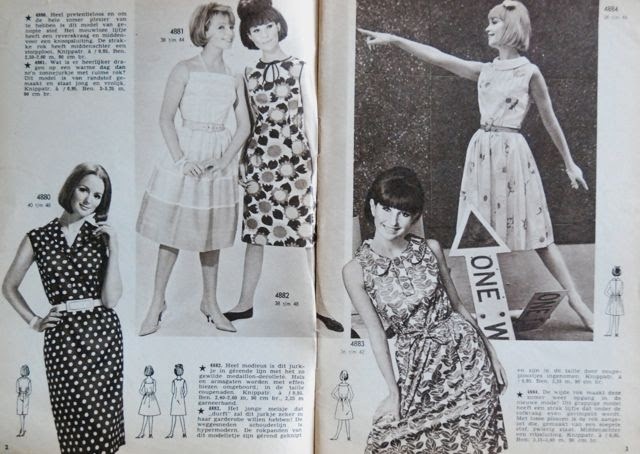 Today, I'll start looking at the 1960's. 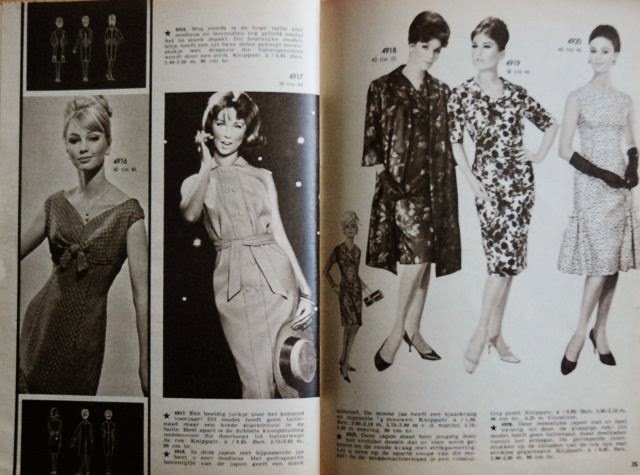 These images come from the March issue of Marion magazine from 1963. 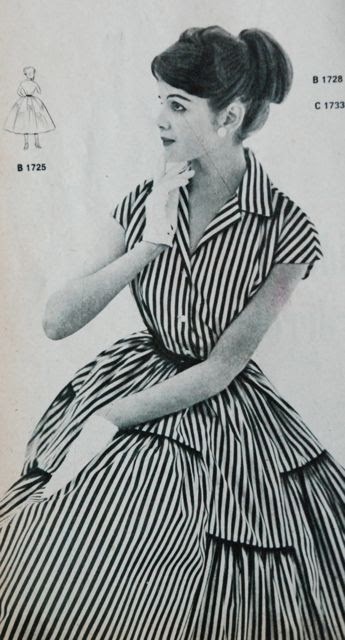 This is still pretty much an early 1960's look: more relaxed and using less fabric than 1950's looks but no mini trapeze dresses yet. 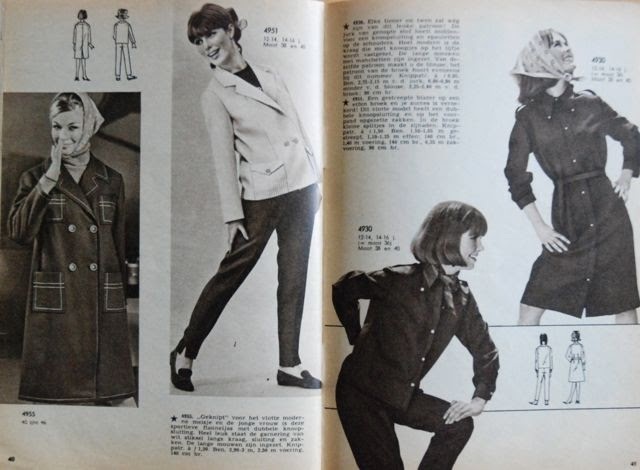 Although it's tempting to go for the iconic style of each decade, these looks might be more wearable for me than the quintessential 1960's styles. Unusually, there are also a few patterns for teenage boys. And not just shirts either. Patterns not included, unfortunately. 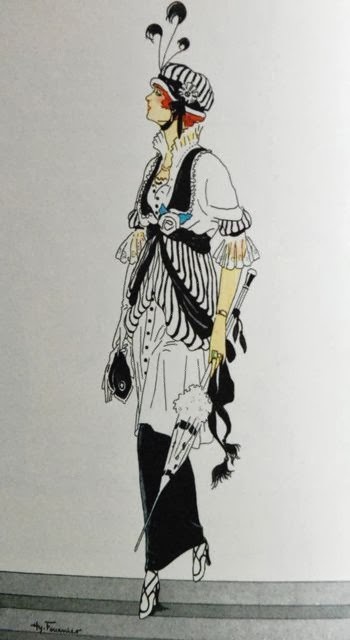 It's even more unfortunate for me that the party dresses are not included in the pattern sheet. I love the one on the left. 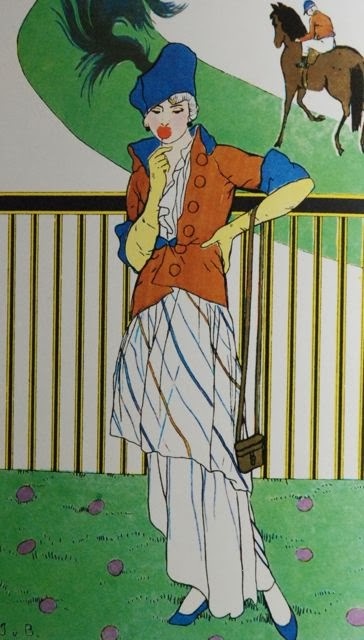 It's no coincidence that I showed you the lovely fashions of the 1910's in the previous post. The garment I've just finished is kind of inspired by some of them. 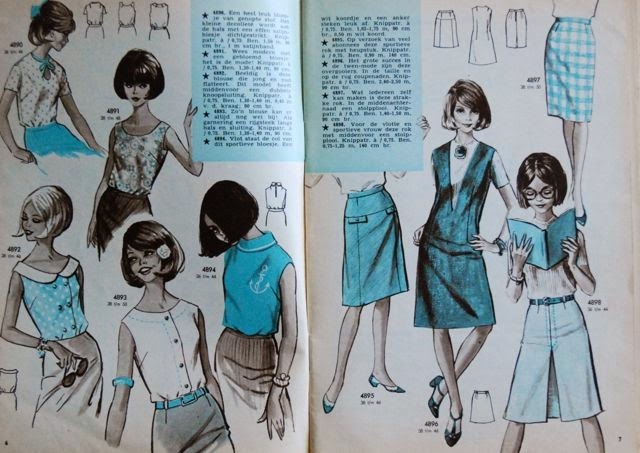 By those hobble skirts which have plenty of room in loose folds higher up in the skirt and then taper down to a very narrow hem. The 1910's inspiration is just 'kind of' because I've been thinking about it before and at that time, inspiration came from a tv series, Parade's End. I've discussed that particular set of considerations when I posted about my plans last summer. 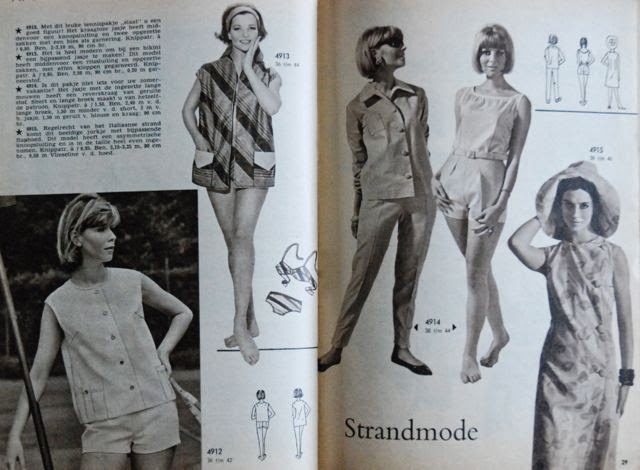 And I already made a summer jumpsuit based on those plans. I love that one, but I still felt like re-visiting the idea and maybe sticking a bit closer to the source this time. A couple of months ago, I stumbled across an ideal fabric. Loosely woven tweed-ish stuff (unfortunately a 'mystery fibre' kind of deal, but it was quite cheap…). And just over a week ago, with spring weather on the way, I decided to just go for it. It is a peculiar blend of styles. If you can clearly see the two legs, it can, from some angles, look kind of 1980's but if you can't, it resembles a 1910's hobble skirt. And of course, I used a bodice which I might also use for a 1950's style dress, so there's no attempt at authenticity there. 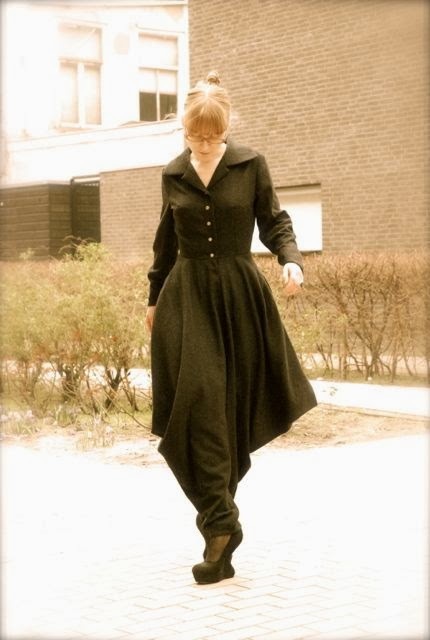 That said, I always wear my 50's dresses belted but somehow prefer this thing without a belt. 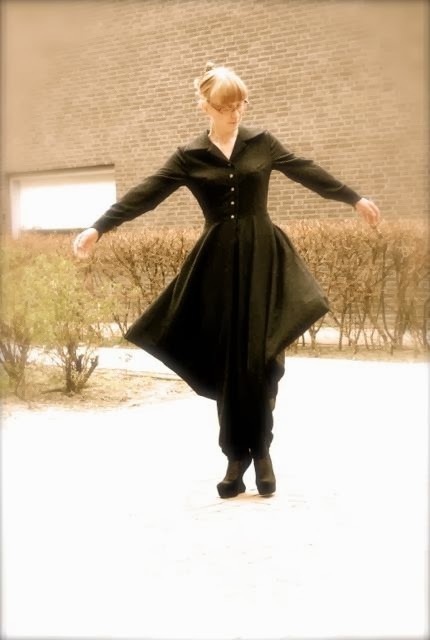 And how often do you see trousers which are good for twirling? 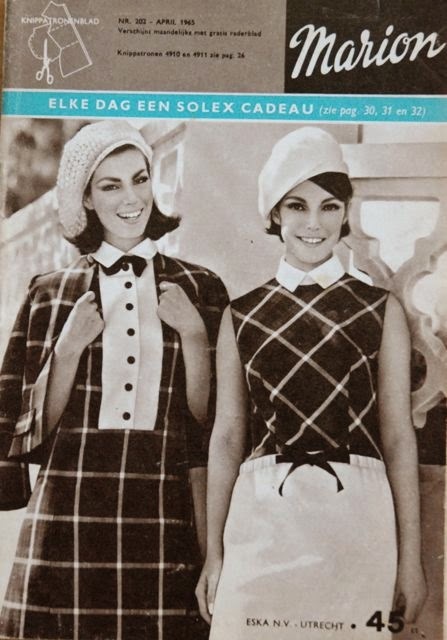 I think I could also play around with putting a camisole underneath and keeping some buttons open (in these pictures, the top button is open). I like how it changes the shape of the collar. As an alternative look. 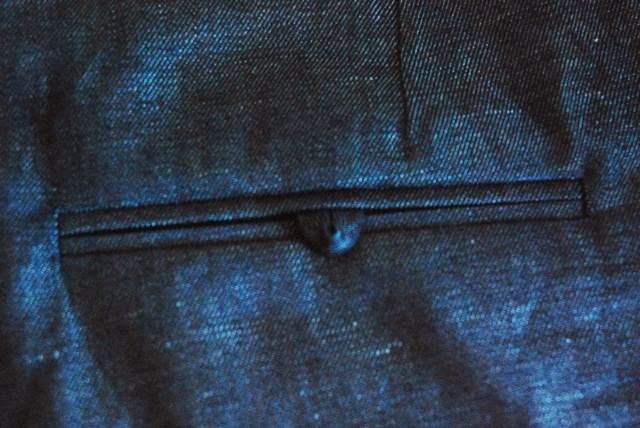 The jumpsuit has pockets in the trouser side seams. And because I didn't want those eye-catching details below the waist, I sewed little transparent snaps on that part of the front opening. It's not like there's any pressure on it at that point. It's an odd thing, but I think I kind of like it. But it's getting warmer now, so I may not get to wear it until autumn…. 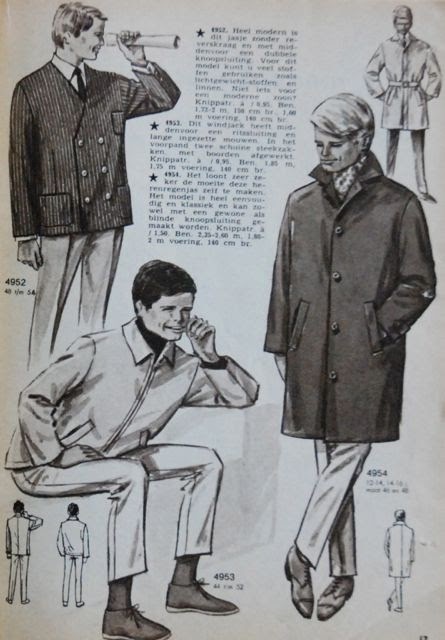 I've got a coat/cardigan thing in mind for it…. Thank you for all the nice replies to my previous post! I'll post about subjects like that again. Today, I've got more pictures. 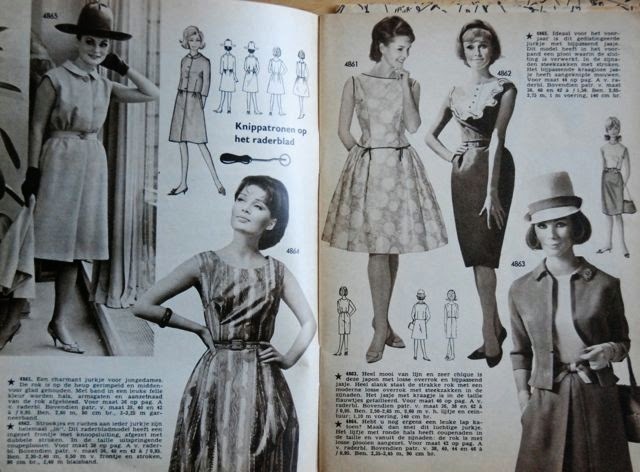 Proper vintage fashion this time… Oh no, actually, it's antique fashion (100 years old, or more). 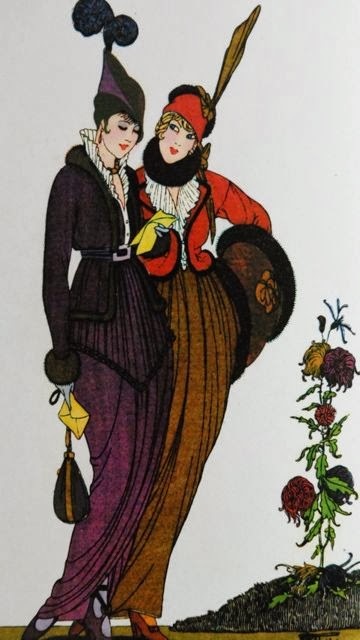 The following pictures were all published in Journal des Dames et des Modes in 1913 and 1914. I don't have original magazines. The pictures come from a late 1980's compilation. 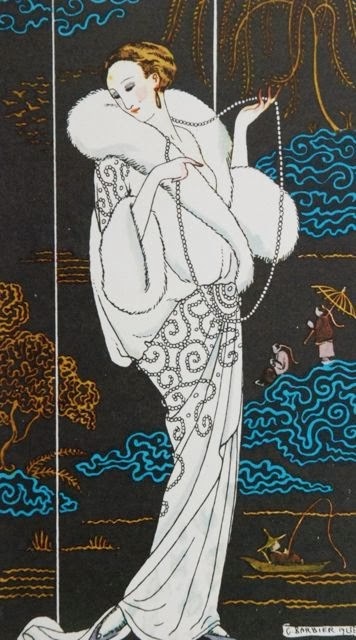 I'm fascinated with these styles from the 1910's. 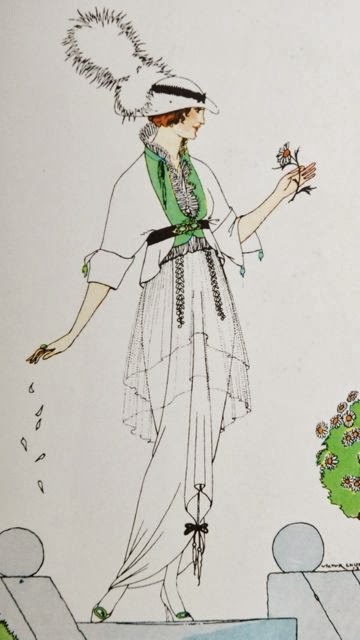 It's so easy to think about fashion history moving from the S-curve, through World War I, straight on to the flapper dresses and bare legs of the 1920's. In fact, there is this really interesting time of development and experimentation in between (probably not so unknown anymore now, thanks to Downton Abbey). This magazine must have focussed on high fashion. 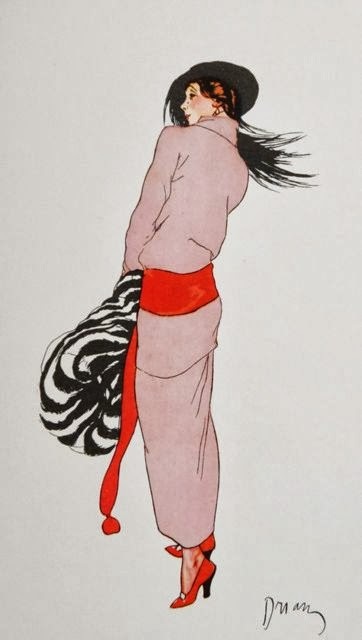 There are some designs credited to Poiret himself and, in general, the looks are luscious, opulent and quite modern in silhouette (modern for the time, of course). 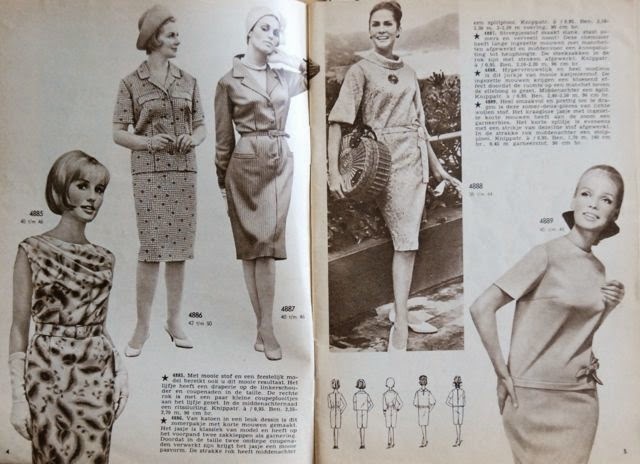 There are plenty of hobble skirts and very few clearly defined waistlines. In drawings, these looks are so endlessly elegant. 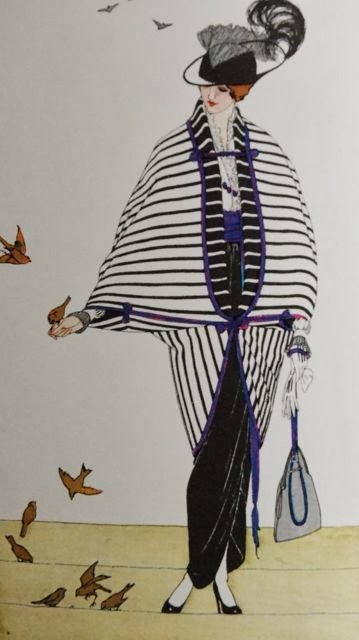 I'd love to find a pattern from a design like this, just to find out what it actually looked like on a real person.